Fellow Dr Philine zu Ermgassen was on BBC Radio 4’s ‘Natural Histories’ programme in June to discuss all things oyster. ‘Natural Histories’, a 25-part series that began on 2 June 2015 presented by wildlife expert Brett Westwood, tells the stories of 25 extraordinary species that have managed to get under the skin of human society and change the way we see the world. On 21 June it was the turn of the oyster and Dr zu Ermgassen joined Westwood, oysterman Richard Haward, and writer and naturalist Peter Marren to uncover some surprising facts about this timid mollusc. Dr zu Ermgassen, whose research looks at the many benefits we humans derive from coastal ecosystems and the key role oysters play in this, works with The Nature Conservancy to quantify the loss of oyster habitats and how this affects water quality and commercially-important fish populations. Protecting and promoting oyster habitats is key to marine ecosystem productivity and this, surprisingly, has a lot to do with how these creatures digest their food. Oysters can filter and clean up to 7 litres of water a day. The tank on the left contains living oysters, whereas the tank on the right contains oyster shell. Photo: Rachel Rouillard. Through their digestive activity, oysters draw elements such as mud or algae from the water column and deposit them on the sediments, which improves water clarity. 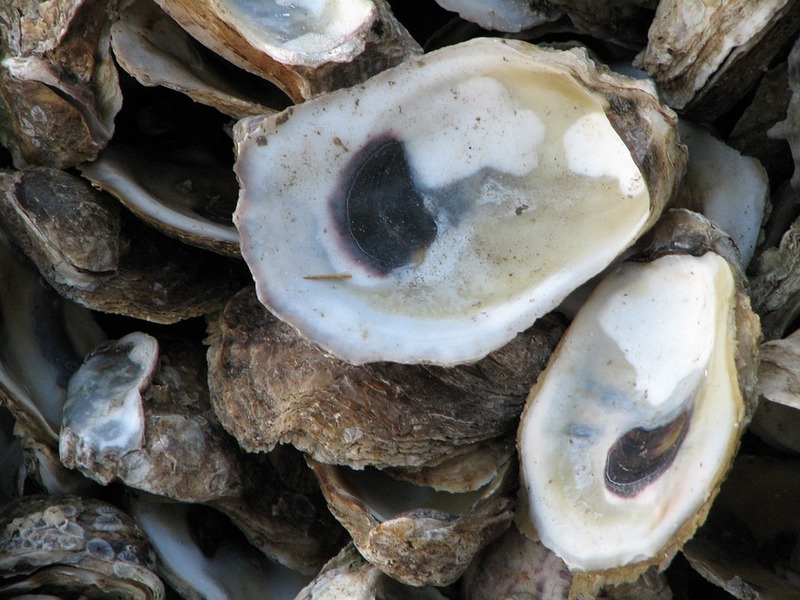 Oysters therefore are the natural hygienists of the sea; they are our seas’ most effective water filters. Europe’s native oyster (Ostrea edulis), however, is in decline in British waters and this is bad news for our fish supplies. Dr zu Ermgassen, who has been studying oyster populations in the US, worked out that for every hectare of oyster reef that you restore the wider estuary will benefit to the tune of around three tonnes of fish a year. “We know that in the US each individual oyster can filter around 7 litres of water an hour. Knowing this we can start to think about what that means in terms of water quality and how many oyster populations we should aim for in certain areas if we are after water quality-derived benefits” says Philine. Once the food of the poor, the loss of British oyster populations over the past century has been dramatic making them luxury food items. Dr zu Ermgassen’s research aims to rectify this and, through it, improve the fish production value of oyster and other marine habitats so that we can continue to benefit from all that the sea has to offer us.